If you are looking for a fun and exciting activity for your children and their friends, then the Seasame Street Bounce House is sure to be a hit. It has a very generous size, sturdy construction, and will provide countless hours of enjoyment for all kids. The Seasame Street theme is sure to be a real pleaser for any child who is a fan of Seasame Street and the many great characters from the show. 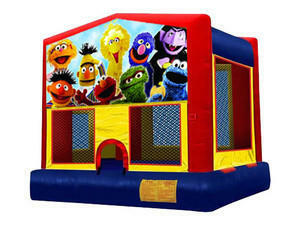 The Seasame Street Bounce House is a large 15 x 15 feet in size. This is plenty of interior room for lots of children to have an absolute blast. With something like a bounce house, having more children be able to use it at the same time can really add to the fun factor. Children can giggle together as they bounce around. The sturdy construction of these bounce houses help to make sure that your children will be able to enjoy them for years to come. The safety walls all around the bounce house will make sure that your little treasures stay safely inside as they are having a blast. The safety walls also feature large mesh screens so parents can easily see into the bounce house to always make sure things are going just fine. The Seasame Street Bounce House features a handy ledge all around the unit to make sure it is as sturdy as possible. This can also be used as a very handy seat for taking off and putting back on shoes. The bright colors of this Seasame Street add to the enjoyment of the children. All of their favorite Characters from the show are featured prominently. Elmo, Big Bird, Cookie Monster, and more are all there to welcome your children into the bounce house for countless hours of enjoyment. The children will also be getting great exercise too.